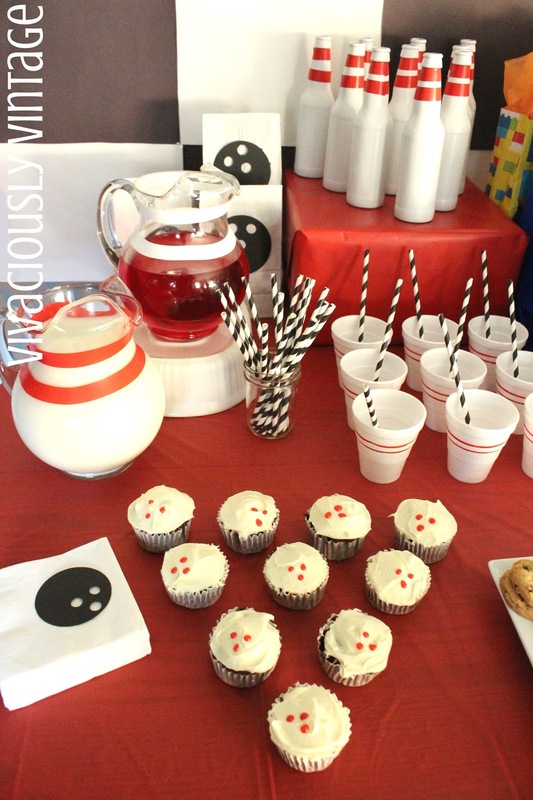 Ansley Designs: Bowling Party in Half a Day! Bowling Party in Half a Day! BOWLING PARTY! - BOWLING PARTY! - BOWLING PARTY! 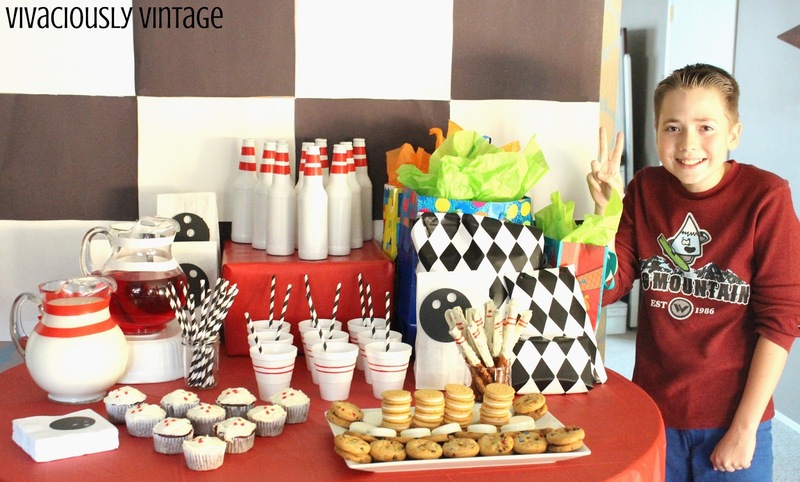 I literally put this bowling party together in less than half a day! I did the shopping the previous evening with the intent on getting stuff started, but I passed out on the couch. I. am. so. TIRED! So, I woke up the next morning with nothing done, and the party at 2! Everyone loves nachos at the bowling alley, but let's be honest - everyone loves nachos anywhere! That was our dinner! 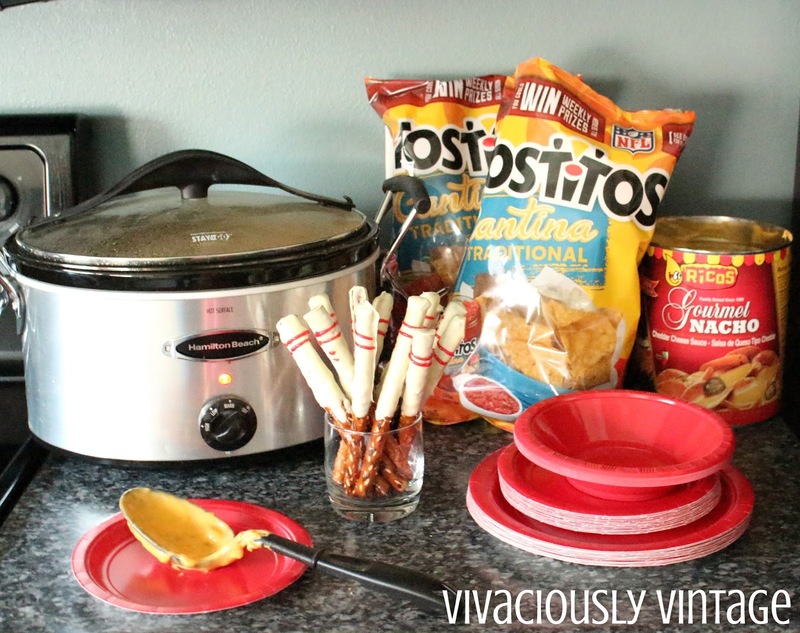 Nacho cheese, ground beef, and Rotel - complete with chips of course! Thankfully this is something quick to throw together. My talented kiddo browned the beef for me, then we just combined it all in the crock pot! 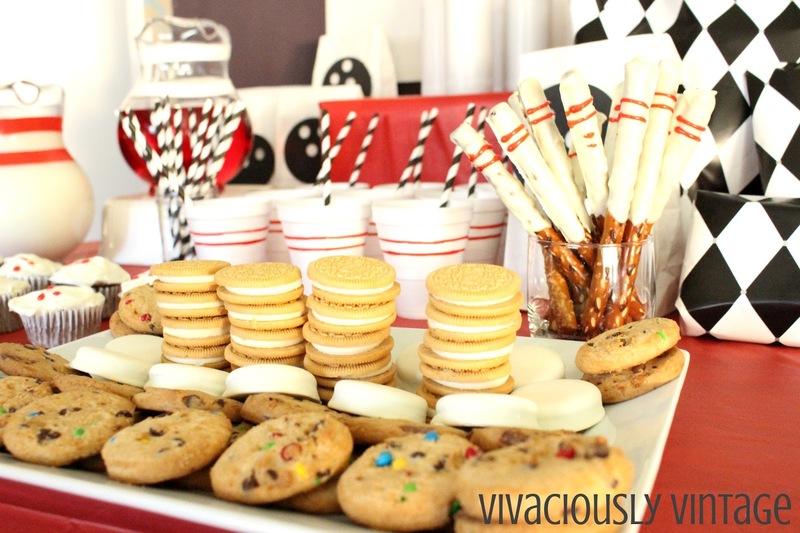 I decided to do a milk and cookies bar...what a sneaky way to get them to want milk! 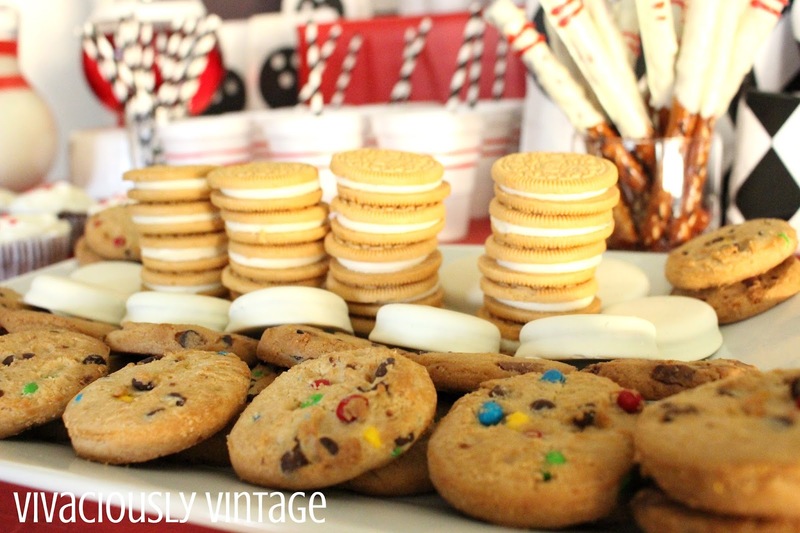 ;) I just nabbed an array of store bought yummies and had kiddo organize them on the platter. I just smiled when I saw it because I wouldn't have done it at all that way, but I love it! It's funny to see how different people's creative minds are. It's so creative how he stacked the center row and organized them onto the corners! I did have a little bit of help, though. Not only did Ethan arrange the cookies, but he baked his own cupcakes the night before. I iced them the next day. 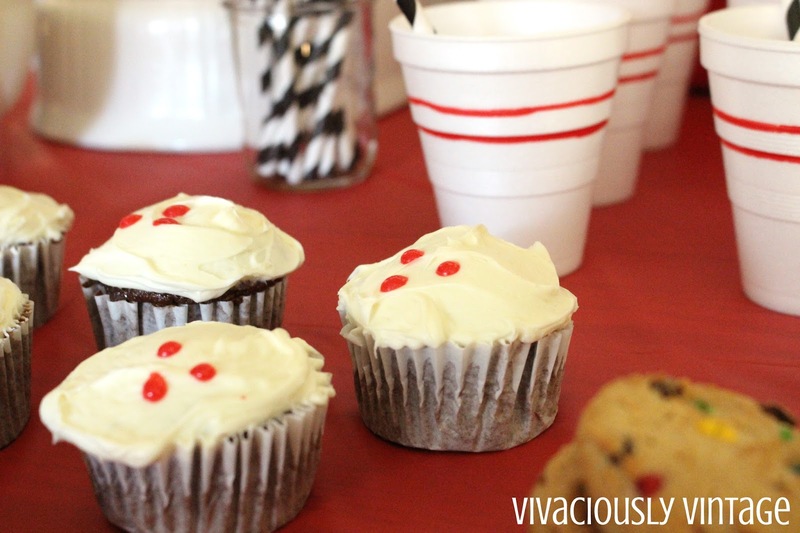 He wanted chocolate cake with vanilla icing, and I made 3 little red dots on them to mimic the holes in a bowling ball! Arrange them like bowling pins, and voila! Speaking of bowling pins. 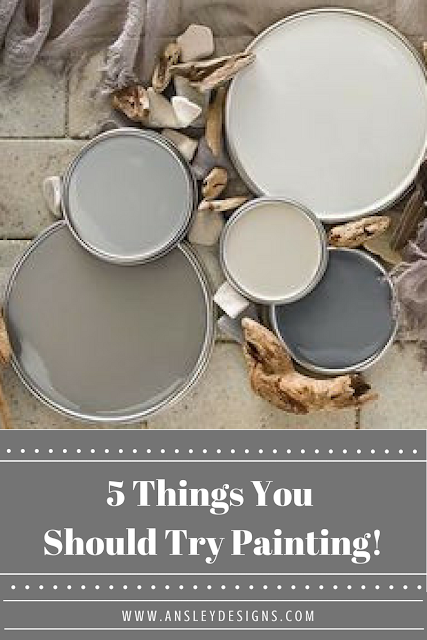 They were so easy to incorporate! 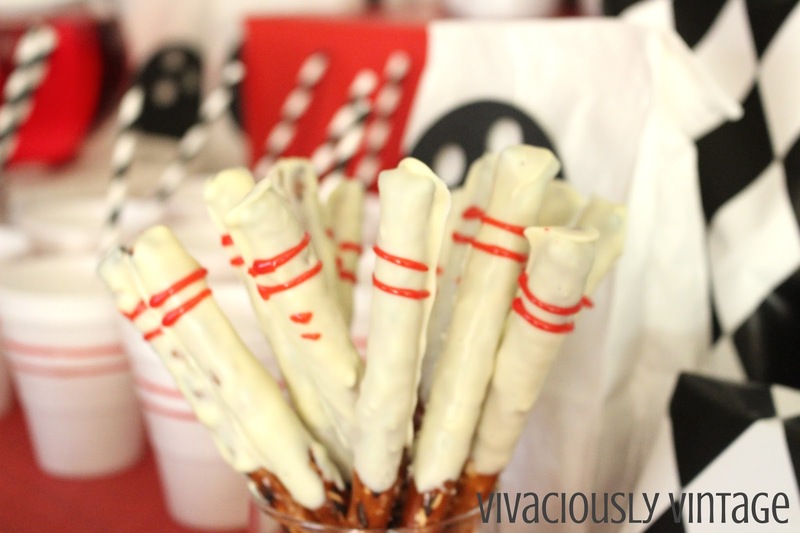 I made these white chocolate dipped pretzel sticks, complete with red bowling pin stripes. I took a red paint marker and just followed the stripes on the styrofoam cups, and I added colored electrical tape to my clear pitchers. 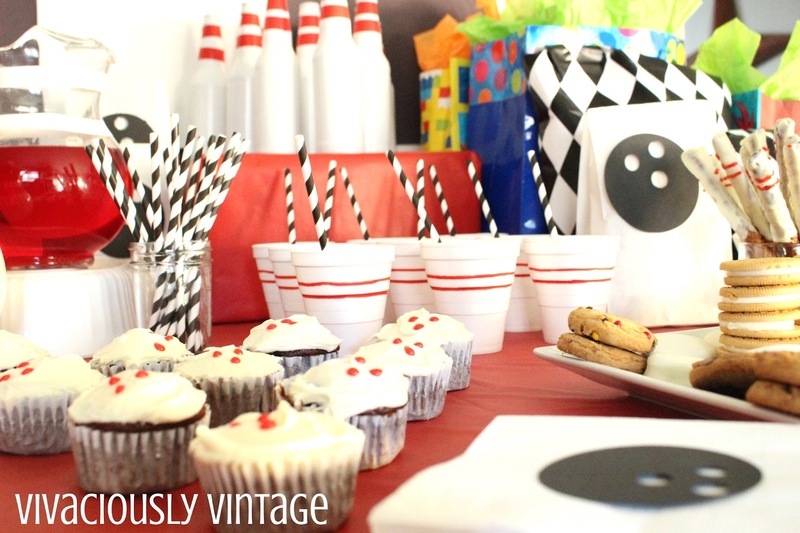 Instant bowling pins! And the pièce de résistance of bowling pins! 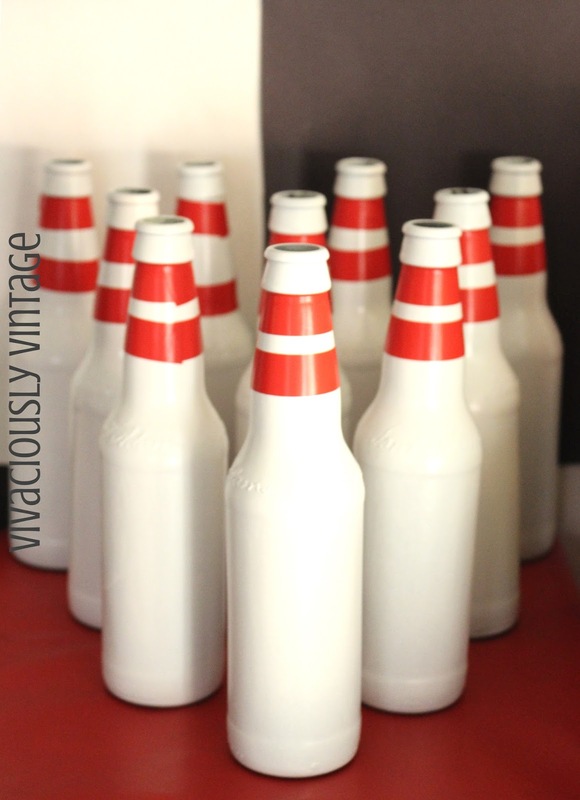 Spray paint 10 bottles white, and add 2 stripes of red electrical tape! Perfection! Fun fact: I literally had my husband downing beers at like 10 am so I could make these! 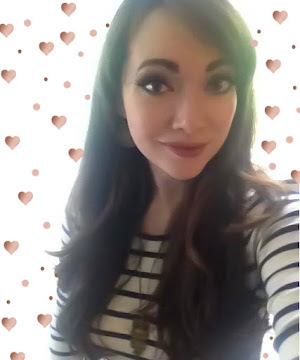 (I told you I was last minute on this!) haha, lucky for him I had already collected a few bottles over the past few weeks! It's 5 o'clock somewhere, sweetie - It's 5 o'clock somewhere!!! I elevated the bowling pins with just a random box we had, wrapped in red paper. Seriously, I didn't even take our junk out of the box! haha. The red table cloth is just a cheap one from the Dollar Tree. I also got the disposable plates, cups, and napkins there. In hindsight, I noticed that the same plates were 3 cents cheaper at Walmart!!! Sure it's only 3 cents, but when I make a special trip to the Dollar Tree for that stuff thinking it's cheaper - well it's not worth the extra time! The checkerboard background is made from black and white poster boards that I cut into fourths. 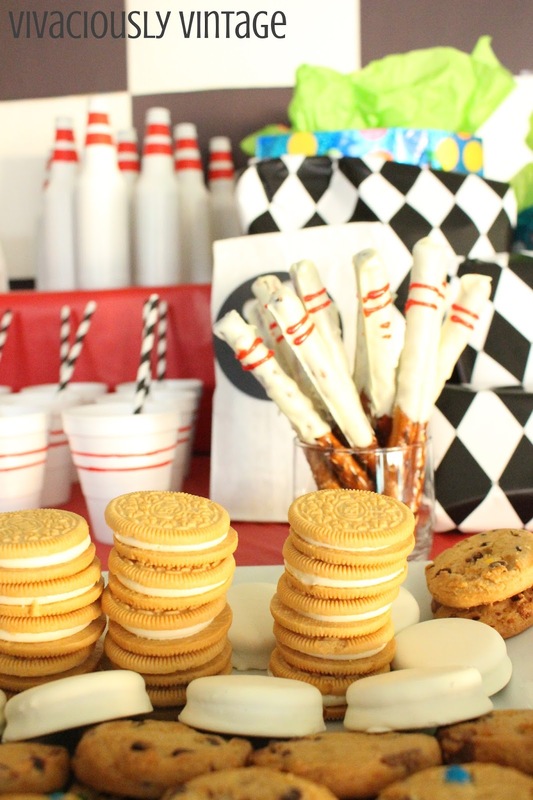 You could also skip the cutting part and use black and white card stock or construction paper. Tape it to the wall, and done! I kept the goodie bags simple. Just white paper lunch sacks with a card stock bowling ball taped to each. I used my silhouette machine to cut out the bowling ball on black card stock! Easy and quick. He got caught peeking in his presents! This picture's lighting couldn't be salvaged...so I just upped the contrast a ton and I think it has a pretty cool retro vibe! 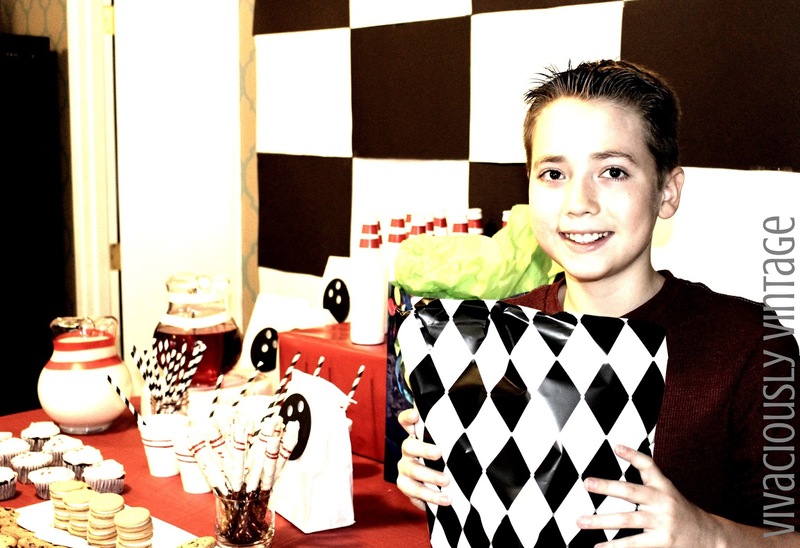 Love the black and white diamond wrapping paper I had on hand. I've used it before in the drawer of this little table! Kiddo still doesn't turn 12 until December 12, but we decided to do his bowling party early in hopes of having a better turnout than one so close to Christmas. Last year we were lucky and had 10 kids! Only 3 came this year, but they had fun. That's what matters! They got lots of sugar and hubby took them bowling so I could stay home with the baby. I wish I could have gone...mainly so I could have nabbed some good pictures! 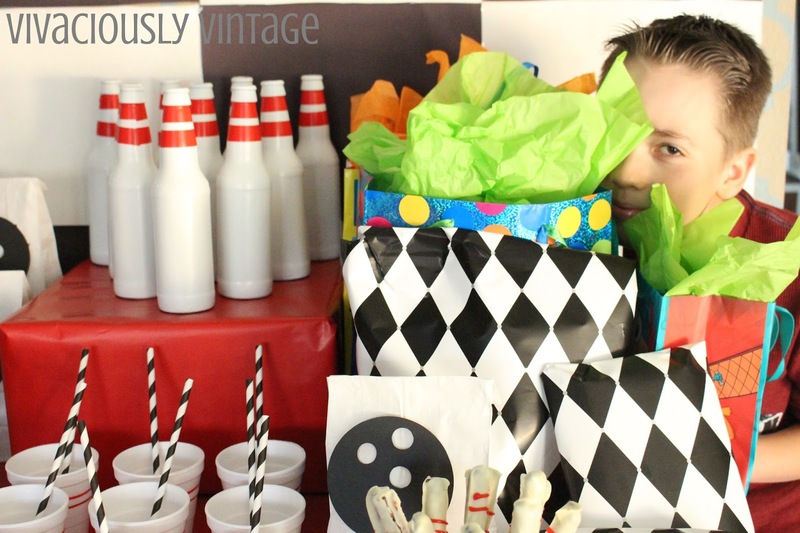 This was a very easy party to put together! 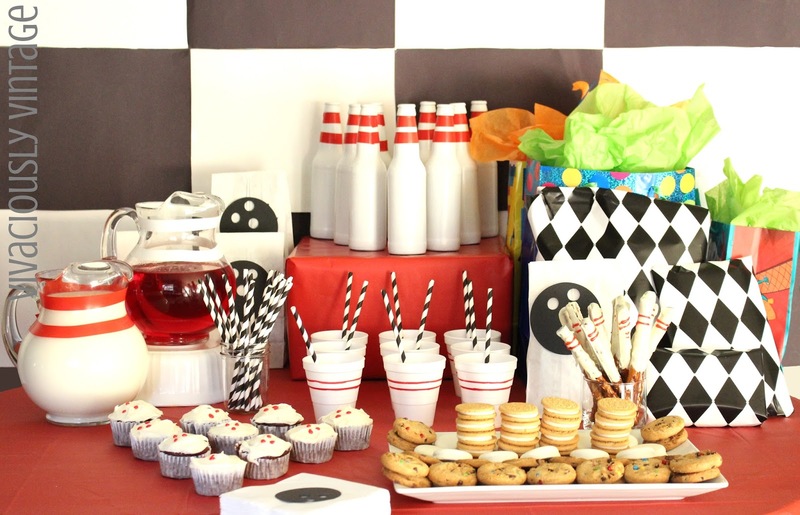 Though if you had asked me that when I was frantically trying to juggle a demanding 3 month old, a dirty house, wet hair, and all this bowling theme decorations and food...the story would have been a bit different! haha! With better planning this would have been cake. Nom!